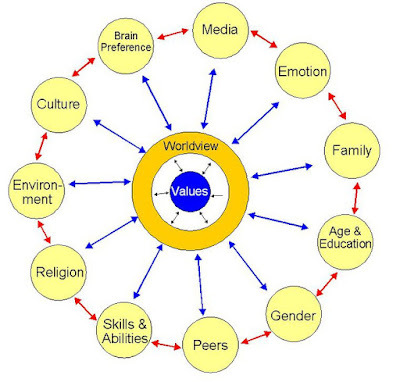 The situation or context in which one finds oneself can have a significant impact on one's worldview and hence values. For example, the second map above could very well represent a person who is in the middle of some natural disaster or war situation. 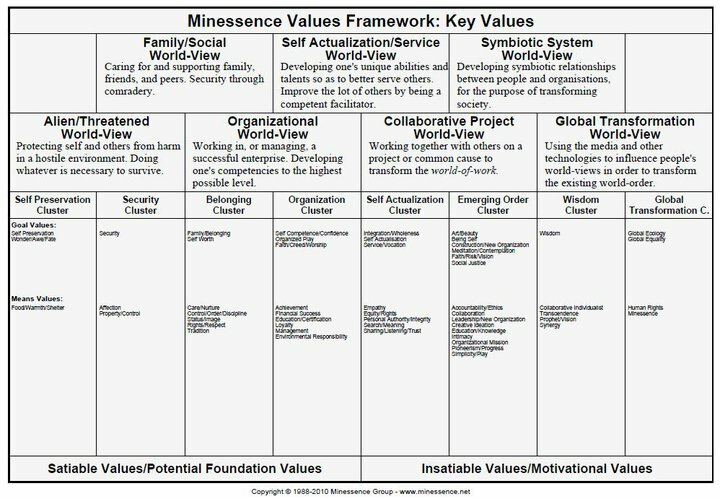 The balance point on the chart indicates where the person is on a continuum with total concern for self on the extreme left and total focus on global issues to the extreme right space. 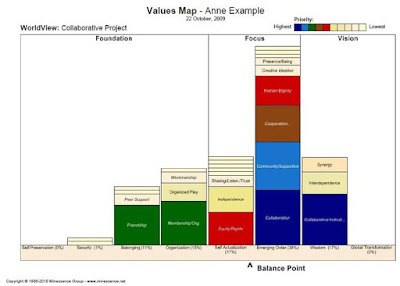 Where a person maps on the MVF Chart is as much due to the context in which they find themselves as is to do with their own beliefs and choices. Where a person maps on the Chart is not a measure of the worth of the person, that's why we say, "It matters not what values you have, what matters is how you live those you have." 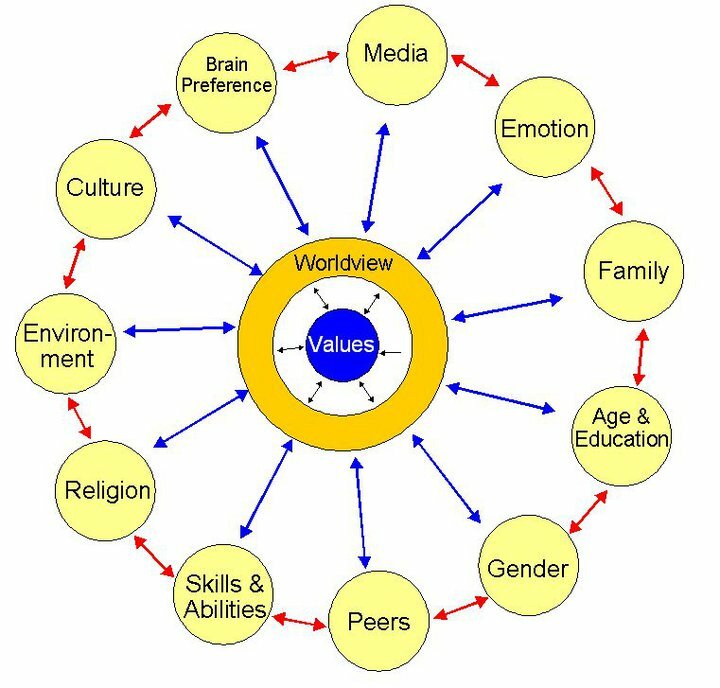 For example, both Mother Teresa, a family business, and the Mafia can all be mapped onto the Family worldview. 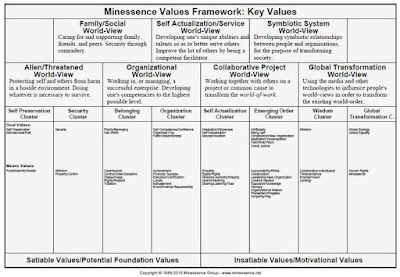 Gandhi, David Suzuki, and Hitler can all be mapped onto a Global Transformation worldview. 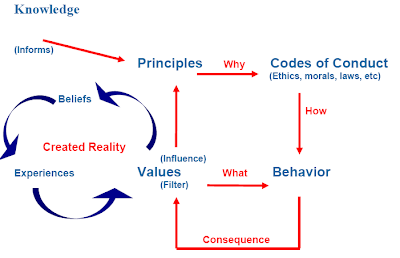 What differentiates people with the same generic worldview cannot be their values, but rather how they live them, in particular, how they treat others who have different values from their own--this is a matter of morals, ethics and principles. These are nice looking charts. Do they have any practical value? 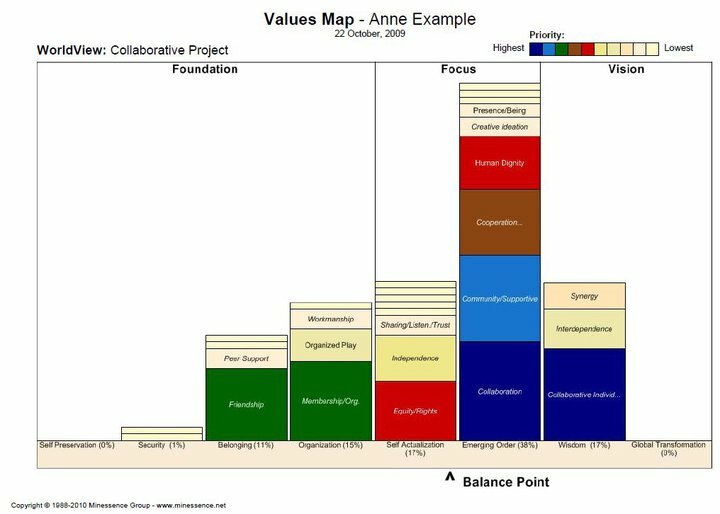 So, if you are a leader, say with the values of Anne Example and you wish to influence Another Sample. 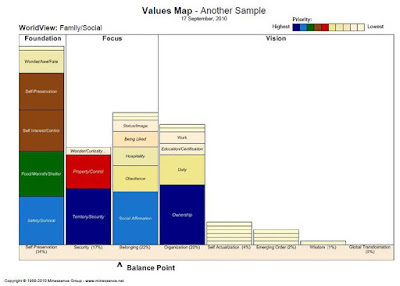 Will Another Sample pay much attention to you if you are communicating to him/her in language which is laced with the importance of your values? Not likely. For a leader or manager wising to influence others, it's the values of these others which matter. Through being sensitive to their values and through using language which shows you understand what is really important in their view of the world, you will gain deep rapport with them and together you'll move in a mutually desired direction.